The Alabama State Capitol, a working museum, underwent a major restoration in 1992. Restored areas open to the public include the House of Representatives, Senate Chamber, Old Supreme Court Chamber & Library, and Rotunda. 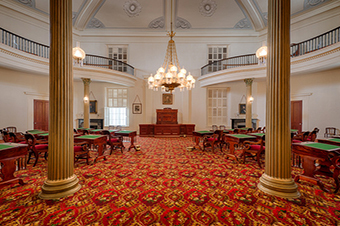 The Senate Chamber is restored to its 1861 appearance. Its ceiling is trompe l'oeil - a style of painting in which objects are depicted with photographically realistic detail. Eight murals located in the Rotunda depict episodes from Alabama history. This work demonstrates Roderick MacKenzie's proven abilities with large-scale painting. Monuments, statues, and gardens are contained on the five-acre grounds surrounding the capitol. The Goat Hill Museum Store specializes in books by Alabama authors, artist-made items, food, unique gifts, and souvenirs. All floors and restrooms are accessible to individuals with physical disabilities. If you have questions or if you anticipate needing special assistance, please contact us at 334-242-3188 or lisa.franklin@ahc.alabama.gov. Guided tours are offered for 15 or more by appointment only. Contact the tour office at 334-242-3935 or capitoltours@ahc.alabama.gov. Guided tours are offered at 9:00, 11:00, 1:00, and 3:00. Appointments are not required.